You’ve done the hard part by deciding to take control of your health. Now let us help you. Welcome to our Lake Orion chiropractic office. We like to let patients know what to expect before they even walk in our door so we tell patients to plan on anywhere from 20-45 minutes for their first visit. You can save 10-15 minutes by clicking the link to New Patient Forms, printing them and filling them out at your convenience beforehand. The friendly front desk staff will ask you for your insurance information and drivers license so we can verify any potential Chiropractic benefits you may have. Take your time. There is no rush when you are in our office. We like to think of this as a “No Stress” environment. 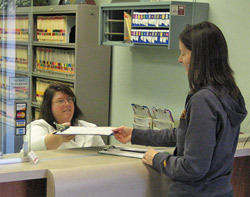 We want you to be thorough with your initial paperwork because I will use it as a starting point for my consultation. When you’re in pain or have chronic health problems getting the right diagnosis is critical. There may be one little box you check on the form that prompts me to ask a question that ends up leading to a vital piece of the puzzle. Based on the information gleaned from your consult we will go into our exam room to further build our case. Specific orthopedic and neurological tests along with a detailed set of range of motions will be performed. With this assessment complete we can determine what, if any, x-rays may be necessary. After a thorough analysis of your x-rays we will put all the pieces together to come up with a specific diagnosis and treatment plan designed to achieve your health goals. Sometimes a patient will come in hoping for care but I may find that they are not a candidate for the services and techniques we provide. I like to let people know right up front that if I can’t help you I will tell you so. I will refer you to another healthcare provider better suited to your condition. 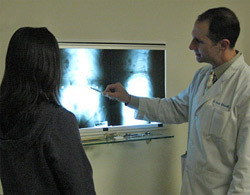 Dr. Frank Iulianelli discussing his findings with a patient. If I can help you then I will explain exactly what is the cause of your condition and the best and most effective course of treatment. By this point my front desk will have your insurance benefits verified and I will go over all costs for your care. I don’t like surprises. Whenever I go somewhere I want to know “the plan” right up front. I think that my patients shouldn’t have any surprises either so I go over how often you would need to come in, for how long (based on your goals) and how much it will cost before any treatment begins. I had so many patients tell me how nice it is to know what to expect before committing to anything. Patients have coined their experience with us as the “No Stress Visit”. Contact us to make an appointment to see if we can help you.